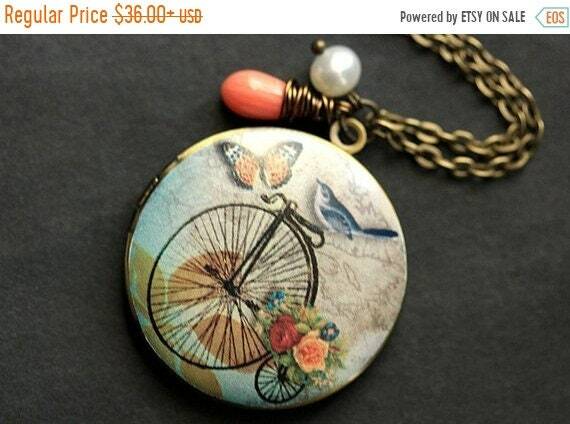 A colorful picture of a couple of a vintage bicycle, pretty bluebird, and butterfly has been screened by hand onto the face of a bronze locket, then combined with a genuine pink coral teardrop wrapped by hand in bronze wire and a fresh water pearl charm, in this handmade garden inspired locket necklace. EASTER SALE Blue Butterfly Locket Necklace. Butterfly Necklace with Pale Blue Teardrop and Pearl. Handmade Jewellery. EASTER SALE Bird Necklace. Robin Family Pendant Necklace with Wire Wrapped Teardrop and Pearl. Handmade Jewelry. Blue Bird Earrings. Bluebird Earrings. Blue Earrings. Bronze Earrings. Bird Jewelry. Nature Jewelry. Handmade Earrings. White Rose Earrings. Silver Post Earrings. Rose Earrings. Flower Jewelry. White Earrings. Handmade Jewelry. I'm so glad I ordered this necklace. I will be shopping for more from this shop! EASTER SALE Deer Silhouette Locket Necklace. Deer Necklace with Black Teardrop and Pearl. Deer Locket. Handmade Jewelry. EASTER SALE Butterfly Necklace. Green Butterfly Necklace with Green Glass Teardrop and Pearl. Handmade Jewellery. 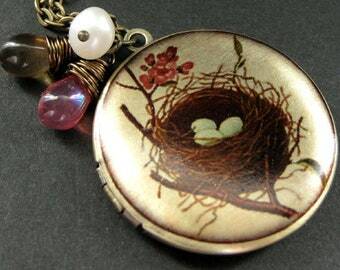 Birds Nest Locket. Nest Charm Necklace with Pink and Brown Teardrops and Fresh Water Pearl. Handmade Jewelry. EASTER SALE Kawaii Japanese Doll Necklace. Kokeshi Pendant with Red Coral Teardrop and Pearls. Handmade Jewelry. EASTER SALE Blue Bird Necklace. Bluebird Pendant Necklace with Fresh Water Pearl and Aqua Crystal. Handmade Jewelry.